The first step to make before even starting to optimize your website for Google, is to check if your domain is under a penalty. A website that is penalized by Google cannot achieve good rankings so your priority is to find out which algorithmic changes are affecting your web property and create a recovery plan. Beginners to blogging and webmasters that don’t have much experience online hear the words panda, penguin, pigeon, hummingbird and wonder why all the online World makes a fuss about these animals! The answer is pretty simple, these are the names that Google (and the press) gave to the different set of changes Google is making to their ranking algorithm. Every year Google officially states that they are making hundreds of changes to their algorithms in order to improve the quality of their search results. Everytime they make a change there are winners and losers. This means that some websites are positively affected because they get better rankings (which means more Google traffic) while some other websites are losing traffic because their rankings were lowered or lost completely. It is well known that you cannot achieve too many things online without Google. Like it or not Google is the best source of traffic especially if you are looking for targeted traffic. Getting your website on the top positions of Google produces a number of benefits that you just cannot ignore. So, that’s the first reason why you should be able to tell if your website is filtered by the Google algorithms. Another reason is that if you know from which Google update you are penalized you can take corrective actions so that next time there is a change, you are out of the penalty (this is not easy but it happens if you make the effort). Finally, recognizing Google penalties can answer the question ‘Why did I suddenly lose my traffic?” since if you are hit by a penalty the changes in your traffic will be more than visible. How to tell if your website has been penalized by Google? Let’s see how to track and identify Google penalties. If you have not yet registered your website with Google webmaster tools, this is the time to do it. Webmaster tools is the medium Google is using to communicate with webmasters and inform them about potential problems their websites may have and this includes manual penalties as well. Before showing where exactly you can find this in Webmaster tools, it should be mentioned that there are 2 types of penalties and it is important to know their difference. #1 – Manual Penalty: A human (probably from the webspam team), imposed a penalty to your website. This can happen because of a number of reasons and it can be either site-wide i.e. affecting the website as a whole or partial i.e. affecting only some pages of your site. #2 – Algorithmic Penalty: This is the most common type and it is automatic. Algorithmic penalties are not reported to webmaster tools and there is no option to fill in a reconsideration request. They only way to identify if you were hit by an automatic penalty, is to use the method described below. Algorithmic penalties are a result of the continuous changes Google is making to their ranking algorithms (that’s when the animal names mentioned above are gaining more importance for webmasters). Going back to the example, you can login to webmaster tools to see if you’re website is under a manual penalty. You can find this under SEARCH TRAFFIC / MANUAL ACTIONS. If you see the message “No manual webspam actions found” then you are clean and you don’t have to take further actions; you need though to continue with the steps below to find out if you were impacted by an algorithmic penalty. In case there is a manual penalty, you need to read the message with the reasons carefully, try to correct the problem and then request a review of the site. The best way to check if your website was penalized by an automatic penalty is to login to Google analytics and review your Google organic traffic. If you see a drop in traffic during the dates that Google released an algorithmic change, then most probably you were hit and that’s the reason that your traffic dropped. 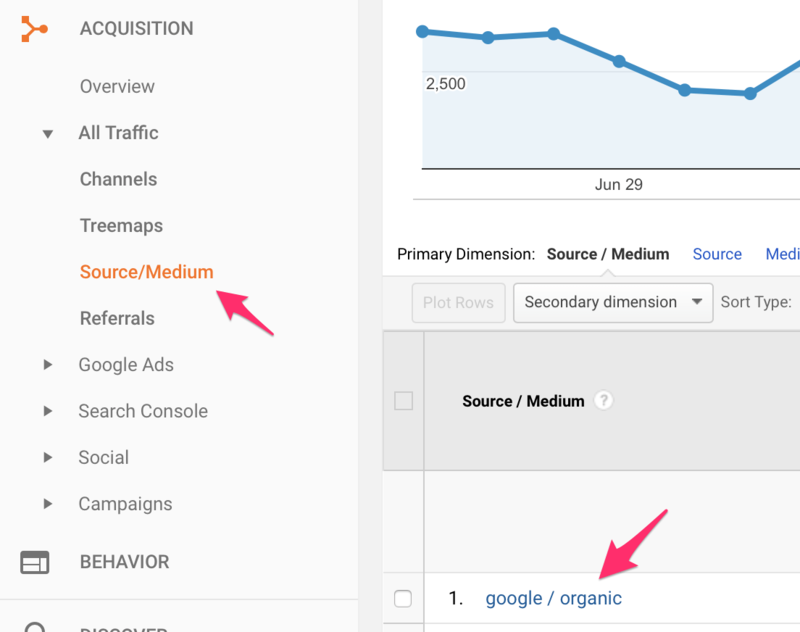 Select your website from the Google analytics dashboard and then go to ACQUISITION > All Traffic > Source / Medium. From the list select GOOGLE / ORGANIC. What you see now in the report is the number of visits you get from Google search. Next, select the reporting period from the top right and go back as much as you can (preferably from January 2011 since Google released a major update, named Panda, in February 2011). What you need to do now is compare the dates that you see a major drop (or increase) in traffic with the dates that an update was released. This handy guide from moz shows all the dates in the last 15 years that Google made a change to their ranking algorithm. Hint: You can also create annotations in the Google Analytics Report so as to mark the dates that a change was made in the same view as the report graph. If you see a sudden drop in traffic in a date (or close to the dates) that an update was released, then look in the moz report to see what kind of update it was and start reading on what you can do to recover. What happens when your website is penalized? The first thing that happens is that you lose your Google traffic (or part of it). The second thing is that you also lose some (or all) of your Google trust and this means that you need to show good faith and be patient until you gain it back. Google does not like websites that are spammy or are trying to trick their algorithm and that’s why they remove them from their index. Getting back to the index does not mean that you will regain your rankings and return to the pre-penalty stage and in addition it will be harder from now on to achieve high rankings. They want to show good websites in their SERPS and violating their guidelines is a very bad move and it is your responsibility (not theirs) to play with the rules all the time. How long do penalties hold? Manual penalties are in effect until you submit and successfully pass a reconsideration request or until they expire. Some penalties may hold for 6 months while we have read of cases that penalties stay for 2 years before they expire. Just to make it clear, when a manual penalty expires, this does not mean that the website is clean and will recover rankings and traffic. It simply means that the penalty is no longer showing in webmaster tools but if you did not do anything to address the issues, the website will most probably be caught by the automatic penalties and still be under a penanlty. When you are hit by a change in the ranking algorithm, you should take corrective measures as soon as possible and wait for the next release of the algorithm to see if you recovered or not. 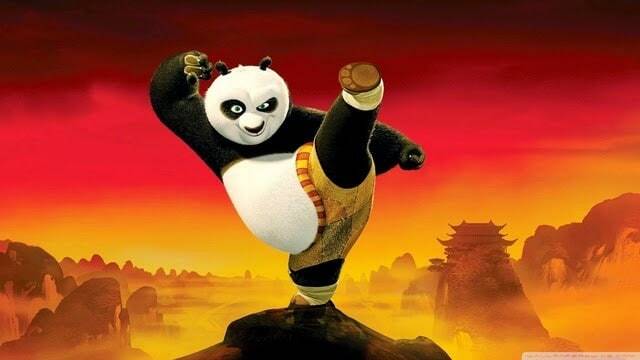 There are some cases that recovery can be faster as there are algorithmic changes that are continuous but in the majority of the cases you will have to wait for the next panda and penguin update to see if the changes you made are producing positive results. What to do if you are in trouble? There is no quick answer, search Google about this and you will see various opinions and many things you can do. Unnatural links pointing to your website – if you did any of this: buying links, exchanging links, guest posting for links, commenting for links, submitting your website to thousands of spammy directories – then most probably you got a manual penalty and a message in webmaster tools. What you can do to recover? Ask webmasters to remove the links (or “nofollow” them), document your efforts, use Google disavow tool to ask Google not to take into account those links and submit a reconsideration request. If you fail the first time, take your time repeat the process and submit a review request again. Unnatural links pointing from your website to other sites – if you used to sell links or have many links in your pages pointing to other sites, then remove those links (or “nofollow” them) and submit a reconsideration request. Thin content – If your website has many pages that have little or no content then either delete them or merge them together. “No index” the pages that are not useful and try to add useful content that is unique and original. Recommended reading: How to find and fix thin content pages. Duplicate content – Google doesn’t like content that is not unique so if you are constantly copying content from other websites stop doing this and follow the same steps as with ‘thin content’ above. Optimize your website – Having a non SEO friendly website is not a reason for getting a penalty, but in situations that you are in trouble by a penalty, it helps optimizing your website as much as you can. You can use my SEO audit checklist to optimize your website for Google. The best way to recover from a Google penalty is to avoid it in the first place. From my experience webmasters are always looking for shortcuts to get higher rankings and this leads them into doing things that Google does not like. I have said many times that in order to achieve good results with Google you need to be patient and play by the rules. Don’t believe what you read about increasing your rankings with tricks that can get you into trouble. If you do this consistently for a number of months, you will start getting noticed and if your content is good it will attract natural links that will improve your Google rankings. Really very informative article. Its helpful for beginners as well as professionals . Thank you for commenting. Sometimes it’s good to get reminder of basic things. Hello Alex, I like your tips very much. 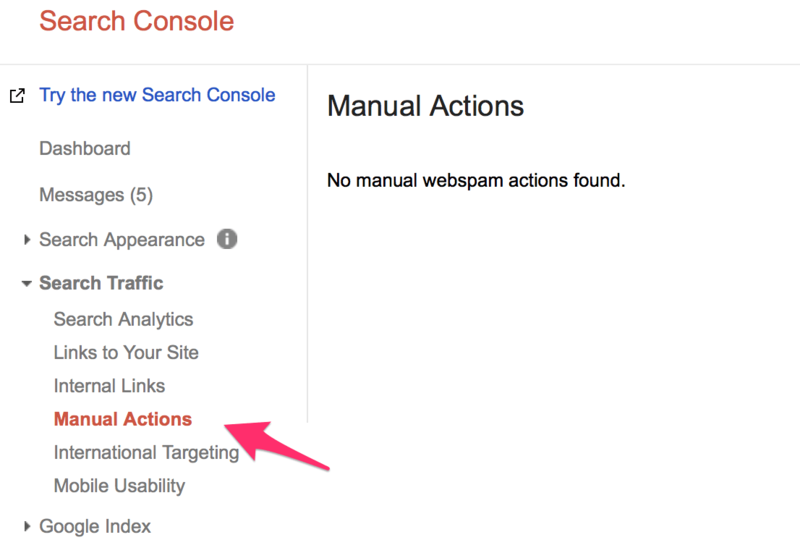 You told me about manual action in Google webmaster that is really great Actually I never noticed it. So it is good that you made e aware about it. Thanks fr mind blowing content. Thank you Sumit. Checking your website status in Google is always a good practice. You many never know when you need it. Thumbs Up. Great info indeed. However It would be great if you would have mentioned any tool to search for Algorithmic Penalty other than looking the data in Google Analytics. However very informative post. Sharing with my followers! Thank you Zeehan. I am sure that there are very nice tools to help you identify if your website is penalised by Google. The data is Analytics and webmaster tools is a good place to get started and then if needed you can do deeper investigation using different tools or online services. Thanks Alex Sir. I am looking for this type of post. From the Help of your post I can check my website is penalized or not. I followed all the steps … but couldnt find the problem … my traffic just went down from last week ….my site’s position in SERP is still there … but traffic went down ….could you help me please? If your rankings are the same then the loss of traffic may not be because of a Google penalty but because of seasonality. In certain niches traffic is not the same for all months. Also make sure that you check only your organic traffic and not direct traffic or referrals since it can sometimes be misleading and lead you to wrong conclusions. Thank you for this great resource. I have a new site and I am not ranking for a long tail keyword I am targeting for the past few weeks. I checked the site and it seems ok in analytics and seach console. What are the other tools i need to thoroughly check out if my site has indeed been penalized in its previous life? Thank you. Check https://archive.org/ to see what kind of content your website had in its previous life. Maybe this way you will understand where the problem is (for example if you see thin content with many links you know that you were hit by Panda or Penguin). From Few Days I Can’t Found Why My website Get Penalized. But After read your informative post I found. Glad Thanks for Sharing These Helpful Information. Thank you so much for sharing this article and tell me one thing my nofollow backlinks is 93% its risky for me? There is no value of ‘follow’ and ‘nofollow’. If you got all the links naturally and it’s 93% then there is no risk. It is normal anyway to have more nofollow links these days than follow links. Great article…my question is, however, if google values content so much then what happens to shopping sites? I run an online store and yes there are many pages as there is one for each product but most of these products have very similar description and short. What can I do to help my site improve with Google? It is true that shopping sites have the issue of similar content. Google was officially asked in a webmasters hangout about this and their reply was that ecommerce websites should try to differentiate their content as much as possible from other websites and from pages on the same website. They suggested addings reviews, comparisons, real user comments and anything else that will make the content of each and every page interesting and unique. It is tough to do but those that manage to do it, are more likely to get better results. I made a huge mistake when I set my website up. I copied all of my blogs from my last website onto my new website. My husband was not happy with me and did a redirect from my old site to my new site, hoping that this would prevent the issue. But I don’t think that it did. I’ve paid over $8000 on SEO services to help my website to show up earlier in the search results for “counseling” in my local area, and I’m still not noticeable (like I get to page 7 of the results and I get so sick of looking for my site that I give up and know that potential clients are giving up too). I don’t know what to do anymore. My SEO company said that they can’t find any penalty, but yet I feel like after 8 months of SEO, with the super stellar content I have on my site compared to most of the other counseling websites in my area there has to be something wrong. Do you have any advice? Please contact me here: https://www.reliablesoft.net/contact/ to see how we can help you with this. Did you do a page by page redirection or you just redirected the domain? Thanks for this post… I need to look towards this in order to know the major reason for the sudden fall in my organic traffic. Hello Alex your article is read good to understand better about Google. My question is that my website is my own personal website and i have not published any blog post since Jan 2014, now I am thinking whether should I continue writing new blog post or start with new domain, cause I never bought any paid backlinks and so one, but I might have done social Bookmarking. Does previous social Bookmarking links will effect now? I believe we have to test it, if I get ranking for my new blog post then I believe I am out from Google penalties. About 3 months ago my server was hacked, it caused me lots of aggravation for over a month trying to get rid of the hack, which was a htaccess hack that was based in a sub domain of one of my clients hosted websites (didn’t update a WP plugin). Anyway, I used to rank page 1 position 3 to 8 for at least 8 keyword phrases, all with simply using good seo practice, and have avoided using any black hat tricks of any kind. But because of the hack though I am now positioned around 17 to 40, basically bottom of page 2 to nonexistent. What is frustrating is that we never did anything wrong, we where the victims, and yet we are now also the victims of Googles algorithm – any thoughts what we can do about this? We have told Google about the hack, they even had a ‘This site may have been hacked’ waning against our site for a while. My guess from looking at the historical data is that the hack has made our site look spammy, and we are now being penalized by Googles algorithm. Thank you very much! That was really good advice about google and possible penalty. I will be more careful from now on. Thank you Alex for this post, I was going to try some black hat seo trick but after reading this I will stay away form that. Any ways great content. Wow Alex this is wonderful. I just got more useful insights on things that can cause a website’s penalty. Great advices, but scarry. Got to you site to understand why my blog traffic plumited to allmost zero in the last moths. Reading this article got my paniked and I feel like I don;t know where to start. I see no messages in the webmaster tool but most probably I did something wrong that I didn’t know of. Starting from zero with a 8 years old blog is really hard. I am considering just giving up. Is there any online tool that can check the site for errors and mistakes like the ones you wrote about? Thank you for you article, very informative . I use SEMRUSH for both backlink analysis and SEO. Among other things, it can tell you which links to remove from Google. I also done a complete SEO for my website.But after one month I see that me website has got penalty by Google.I found No reason for that.But I got one hint”s witch is In my website I give 10 affiliate link.Is this reason I think I got penalty.Is it true? very well explain. please also share your thought how to check if adsense ban on any domain or site. I was in search of an article which describes me everything about google penalty. Yeah, finally i got it on your website. Thank you and keep up the hard work. Thanks for this. I once think I was hit by Google. But later found out it was because of a move from HTTP TO HTTPS. Thnks Alex, Its an interesting article and I have one doubt that you mentioned “avoid keyword anchor text when linking out” as per my understanding I am getting that we cant give anchor text for a keyword?? For example “Fitness” is the keyword & we cant link our website on this keyword (anchor text) while posting any ads or post over another website. Please correct me if I misunderstood. hello i have a new blog that is 3 month old now, i have been wrighting good content with proper seo but for this 3 months i have only gotten one organic traffic. and any post i make i found out that it will be in page 4 or 5 of google, pls what should i do, i have check and i do not have any manual penalty and i don even have any organic traffic to check google analystics for the second method please help me. We just discovered why one of our sites seemed to not rank no matter what we did. We picked this site up from another SEO company. The structure of the robots.txt file had blocked access to a lot of content and resources. We just noticed this by checking the GWM tool Blocked Resources feature. Hello, one of my keyword had just lost from google search pages, after i move from HTTP to HTTPS, but for other keywords are stil there…i thought it because of google penalty, but why only just 1 or 2 keywords of all? Can you help me n what i should do to get it back as before? Thank you for a very nice article! I searched google to find why a great part of my traffic has been lost. But I don’t see any big drops. It has just gone down by about 22-25% over the past 1.5 years. It’s an online store, where I have a 14 year old domain that has been used for the webshop all the time.. I used to have #1 rankings on almost all my large keywords. The shop has sold the same 1200 products for years now. And I have not done much other than adding some new products each year. Any suggestions on a good way to work my way back to my #1 rankings? Besides penalties, your traffic might be lost not because you did something wrong but because the competition did something better. Rankings are not static and websites that do on-going SEO work, are the ones that survive at the end. What I suggest, is to check your Performance Report in Google Search Console and use the historical data to find out when and for which pages / keywords you lost rankings that resulted in loss of traffic. Then use tools like SEMRUSH to analyse those pages and improve them, taking a closer look what competitors are doing better. It is a Great way of explanation to know How to find the Penalty. But still I have few Questions “Is there any Tool available” Officially from Google to show which is got Penalized. ? At what extent i can Trust Moz Spam score ? What is the score i should follow. There is no official tool from Google, other than the Google Search Console. You can trust Moz Spam Score or SEMRUSH toxic score but the best approach is to manually review links before adding them to the disavow tool. Read this: https://www.reliablesoft.net/clean-bad-backlinks/ for more details. Great post Alex, some extremely valid points explained in details. Another good article Alex. Its always a good idea to double check ones online properties after an algorithm update. If the webmaster/SEO was doing their job right there should be no problems. Google penalties are always really tough to deal. One cannot keep calm when they see google penalty. They feel like everything has gone. I can imagine when I got penalized by google, it really felt so horrible. Really helpful article. After searching a lot about this at last here I have found a great answer. Inform also if there is no algo update during the period I lost traffic then what can be the reason? Thanks for sharing this useful information! I think I am hit by an algorithm penalty. I will merge some articles together to I have less thin content. Hopefully it will get me out of troubles. Keep up the good work :)! Thanks for the write up. Penalties are getting more common place with Google’s algo changes and in many cases people can’t pinpoint causes with out using search console. Your insight is much appreciated! Thanks for sharing this informative article. Google sometimes back penalized my website because i was aggregating YouTube videos to my site and so i was caught unaware. And it is possible that someone buyed thousends of spam links and that penalized you?. This month i sensed a big dump in my adsense revenues, made some research and found that, thousands of spam links to my site ..